Over 2,000 girls were named Destiny in 2014 alone. This equally dramatic and meaningful possibility has been overlooked. 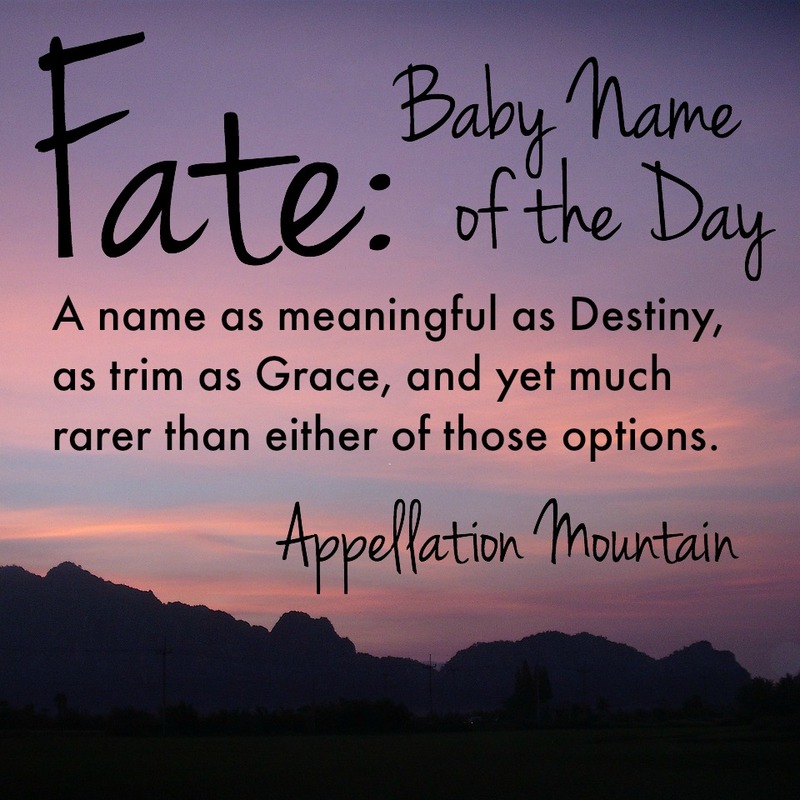 Thanks to Virginia for suggesting Fate as our Baby Name of the Day. At first, Fate doesn’t feel like a name. Except that Kate, Nate, and Tate are all acceptable – even classic – names for children. So it’s hard to argue that Fate’s sound is unworkable. 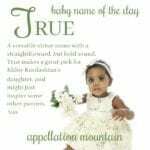 Fate fits with a second trend, too – our preference for short, meaning-rich names for children. From classics like Grace and Faith to more modern picks like True, it’s a popular category. The word comes from Latin, but here’s a twist: it comes from fatum, which translates to an utterance. Fate is a decree of destiny, a declaration of the gods. As the word evolved, it came to mean a prediction or something inevitable. It’s been used in English since the 1300s, but the meaning has shifted subtly over time. At one point, it had a negative connotation – fate was usually used to describe bad luck. Doom, if you will. Think of our word fatal – originally it meant ordained by fate, but since the 1400s, it’s been associated with death. Today, fate seems much more neutral, maybe even romantic. It was fate that you met your partner at the cafe/airport/picnic. Or fate that you would pursue a career in the arts, just like your father and grandmother. Fate has become something we give in to with pleasure, not a terrible force beyond our control. Greek and Roman myth have a trio of goddesses commonly known as the Fates. So does Norse mythology, where they’re called the Norns, and Slavic – they’re the Sudice. Shakespeare’s Three Witches in Macbeth serve the same role. Clotho, Lachesis, and Atropos are the Greek Moirai. In Roman, they’re Nona, Decima, and Morta – the Parcae. Urd, Verdandi, and Skuld are the Norns of Norse myth. I couldn’t find names for the Slavic Sudice. Shakespeare’s witches are unnamed, but they’re also called the Weird Sisters, from the Old English wyrd – which meant fate. That phrase inspired the Weird Sisters of Harry Potter fame, as well as a trio of characters from Disney’s 1990s-era series, Gargoyles: Luna, Phoebe, and Selene. 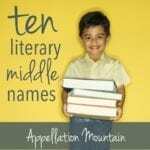 It almost makes Fate a mythological name in the key of Juno or Daphne. The natural world gives us Fata Morgana – an elaborate mirage, typically seen right above the horizon. Fata Morgana is the Italian name for Morgan le Fay, the sorceress from Arthurian legends. The mirages were believed to be the work of witchcraft, designed to lure sailors to their death. (There’s a scientific explanation, of course.) Fay refers to fairies, but it also comes from the same root as the word fate. Then there’s Magical Girl Lyrical Nanoha, a Japanese anime television series from 2004. A manga series, a movie, and more followed. Nanoha Takamachi is the main character, and Fate Testarossa is an opponent in the race to find the Jewel Seeds. Back in the 1960s, Fate Echols played football for the St. Louis Cardinals. Echols was born in 1939. The peak year for Fate as a boy’s name was 1943. In 2014, nine girls were given the name. 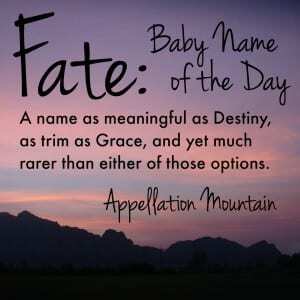 Overall, I think Fate works best as a bold middle name possibility for a son or a daughter. What do you think? Does Fate work? For a boy, a girl, or only in the middle? Faith was too common and more of a meaning towards religion, whereas Fate was aimed towards a meaning for something or destiny and not as common. My great grand father and great uncle were named Fate. Interesting choice, and they were from South Carolina. There is a great little independent film called Songcatcher, with Aidan Quinn, Emmy Rossum, and Janet McTeer; It takes place in the early 1900s in Appalachia and there is a teenage boy character named Fate Honeycutt. He’s kind of a mean guy, but I still like the name. It’s one of my favorite films and I even have it on DVD, so for that reason alone the name Fate skews masculine to me. Songcatcher actually has a lot of great names: Eleanor nn Elna, Deladis, Viney, Harriet, Dexter – I guess turn of the century Southerners had good taste! I’d be down for a Fate. I like it better than destiny, I think, and that’s probably because it sounds both like “Faith” and like “Faye” (in addition to the “Kate” mentioned). I probably wouldn’t use it myself on a human baby, but I might go for a character. I think I kind of like Fate. I don’t know if I’d use it, but strikes me as seeming very interesting and surprisingly wearable. Your mention of True reminded me of a recent sighting I really enjoyed – in the movie Friendly Persuasion, a film from 1956 about a family of Quakers in Indiana during the Civil War. The family’s teenage daughter was named Martha True, called Mattie throughout the film. I was surprised to see True both on a piece of media from the 50s and on a character living during the Civil War, but I guess the writers thought it worked as a Quaker/Puritan sort of name. I also really like Nona and kind of like Clotho, though I strongly suspect Clotho wouldn’t be usable. Martha True, called Mattie? LOVE! And I don’t know that it’s impossible for that to be her name – with no stats on middle names, it’s impossible to know how many parents were daring, and how many of us have played it safe over the years. The protagonist of Star Ocean: Till The End of Time (an RPG for Playstation 2) was named Fayt Leingod. I found the name heavy handed then, and I don’t think I like it any better spelled “Fate”. Interesting, Sara – thank you! And “heavy-handed” might be a good way to describe the name. Swistle always talks about whether or not she would like the name, and I think I can honestly say that I would find Fate hard to wear. Yeah I think it would be difficult to pull off in real life.